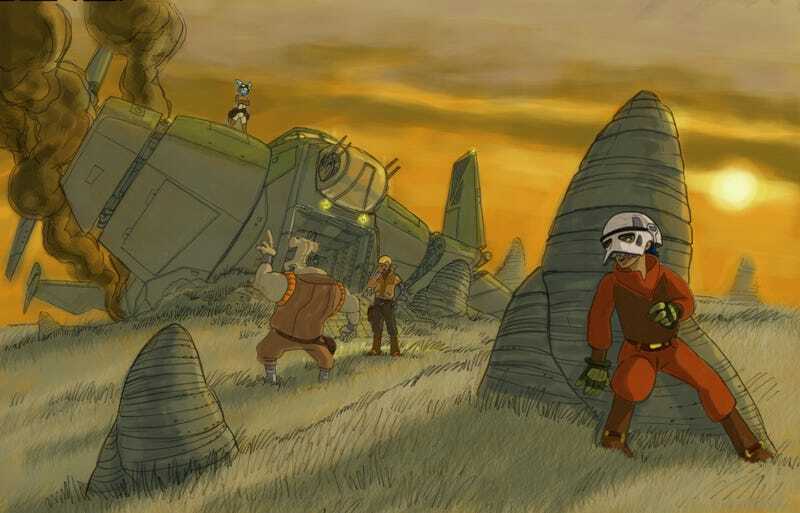 We adored the CG Star Wars TV series Clone Wars and we're enjoying Star Wars Rebels, but this concept art that Rebels showrunner Dave Filoni has shared just reminds us how cool it would be to see another 2D animated Star Wars show. Star Wars Rebels concept art from StarWars.com. This is kind of fun, because it shows you what the characters were going to look like early on There is also an early image of the Ghost there. It was much more B-17. Zeb was an Ithorian. Kanan looked more like Roy Fokker. The Hera/Sabine character was combined and younger, and Ezra is in his early costume and a busted stormtrooper helmet. This was the first drawing I did where we said, "Okay, this is what we definitely want the show to look like." I was calling it "Tower Story" because I was all about having those towers in the show. The whole piece is worth reading, especially for the pieces of concept art that Ralph McQuarrie painted for the original trilogy that the Rebels team ended up adapted for Rebels. But it makes me think so much of the wonderful Genndy Tartakovsky Clone Wars TV series, and the energy that hand-drawn designs brought to Star Wars. Rebels is a perfectly fun and engaging series, but this artwork, even just as rough concepts, looks lovely.